Aza Ray’s parents were never aware that their daughter was switched at a very young age. Aza Ray has miraculously reached her teen years after many hospitalizations as a result of a strange lung disease. Her health takes a sudden bad turn when a feather in her lung is discovered. She dies. Or does she? At the point of death, she is whisked away to the sky ship – think boat with sails – where she was stolen from all those years ago. Her death leaves her genius best friend, Jason, despondent until he puts the pieces together and comes to believe she is still alive. It turns out there is a whole other world in the skies where people have birds in their chests and the sky people steal food from the humans of earth. 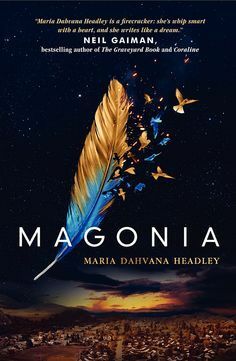 This is the sky world of Magonia and it is in a heap of trouble but Aza Ray offers hope. Hmmmm. I kept at this. Trying to make sense of it. Even though I am fine with parallel universes, magic, dragons, werewolves and time travel, the minutiae of this story – the whole bird in the chest thing – was one of many story elements that didn’t sit well. For the reader who is willing to look past that, there is action, adventure, a bit of romance and boats that sail in the sky.